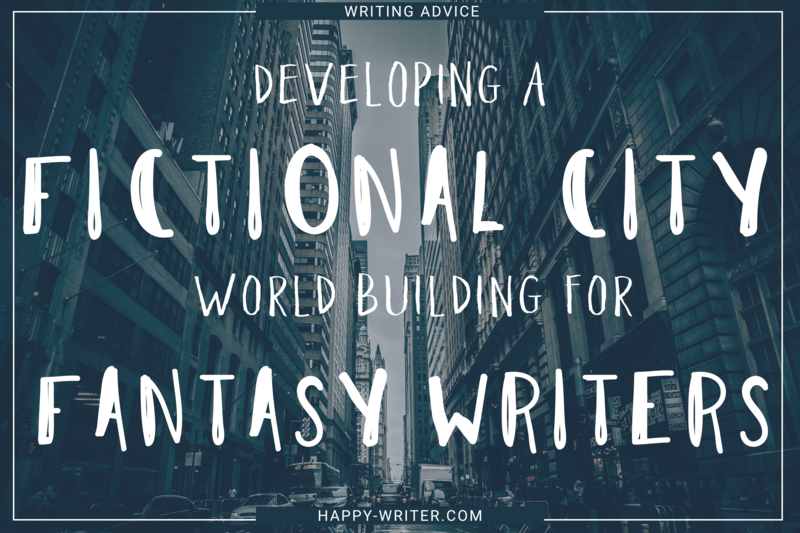 Creating a city from scratch can be an intimidating task for a fantasy writer — you want your city to feel like a living, breathing place, with its own personality, elements of fun and fantasy, and believable enough and descriptive enough that the reader can imagine themselves plunked down into the middle of it. Consider some of the best, most vividly written cities in fiction. Closing your eyes, you can see the snow-capped cottages of Hogsmeade that look like illustrations on Christmas cards; you can see the colorful and extraordinary shops of Diagon Alley, cluttered with stacks of cauldrons, barrels of beetle’s eyes, hooting owls in ironwork cages; shoppers in ankle-length Wizard robes. You can see the stone buildings climbing up the mountainside of Gondor, you can see the shifting grass plains of Rohan, can picture the Shire with its farms and flowers and so many green hillocks punctuated with round front doors. Ugh. You can literally smell the honeysuckle and the pies cooling on windowsills. Fantasy villages, towns, and cities are scrumptious to read about, they’re visceral and eye candy and exciting. So, how do you go about creating one such (or many such) cities for your own fantasy novel? Decide on a few significant, tactile, defining features. For instance, as I mentioned above, Hogsmeade is a snowy city of cottages and shops that resemble a Christmas Card. Gondor is built up a mountain; Rohan has its horses. Find a few striking, significant details that define your city and make it unique from any other in your story. Come up with a sentence that will describe your city in a nutshell. Local Landmarks. Maybe your city is built up (or under) a mountain. Or it’s made of boats interconnected across a lake. Your city could be in the middle of a forest, or have a huge weeping willow in the middle of the town square. Maybe it’s wedged in a cavern behind a crashing waterfall, or built on stilts along a treacherous cliff. Maybe your city is slimy and smelly because it’s built around belching bog waters; or maybe it’s a prosperous fishing village built along the ocean. Place your city somewhere concrete and interesting. The General Atmosphere. We almost always see Hogsmeade buried under snowfall. Maybe your character visits this city while it’s under a gloom of stormclouds or clashing thunder. Maybe the town is located at a high elevation where strong winds send the flags flapping and make the tall buildings creak. Maybe it’s a sad, sour city where the streets seem dark and greasy and the people glum and downtrodden. Maybe it’s a city of flaunted riches and exorbitant wealth. Assign a feel to your city that relates (either mirror or contrasting) with your character’s internal feelings when they visit. For instance, Harry is bursting with joy to find out he’s a Wizard, and arrives in Diagon Alley to find it similarly bursting with amazing and interesting Wizarding gadgets and goods. His hunger for this new world is satiated by immersing himself in the bizarre bazaar of Wizarding shopping. The townsfolk. When you think of the Shire, you think of Hobbits growing crops and having feasts. When you think of Diagon Alley, you see Wizards and Witches with moneybags of golden coins happily shopping for owls and Potions ingredients and magical books. When developing your fictional city, think of the types of people unique to your city and how these townsfolk might populate and characterize the place they live. For instance, in a Floridian city like the one I live in, you’re going to see a lot of beachy people in flipflops and leathery tans, and wrinkly old people shuffling along, and tourists getting obliviously in the way; whereas if you visited a university town, you might see a much younger, more diverse, maybe more raucous crowd walking the streets. You’ll find a different atmosphere in New Orleans versus Seattle or Washington DC. Giving each city a unique aspect that makes it stand out from the rest will help your fictional locations cement themselves in your readers’ minds. Consider the landmarks and location of your city and create a name that incorporates that. Find root words in Latin or Greek or other languages specific to your book’s culture and derive a name from them. Consider the town’s history and maybe create a name from its founding members or specific mythology. Find a word (or create one) that evokes the right atmosphere and mood. When in doubt, use a name generator and play around with the results. Here are some resources: Mithril and Mages’ City and Town Name Generator // Name Generator 2’s Town Name Generator // Chaotic Shiny’s Place Name Generator. Another thing to consider when building your city is the actual layout. Is it built around the coast of an ocean, or along a winding river? Is there a rough downtown and more affluent uptown? If your character has to walk from their house to the tavern, how long should it reasonably take them? If they’re running for their life through an unfamiliar city, what districts might they run through, and where could they end up? You can keep using the words “street corners” and “shops” and “she turned left”, but deciding on an actual layout will help you add depth and detail when describing your city. Even just scribbling a rough map on a piece of notebook paper to keep yourself oriented as your character walks around will help keep your story organized. The more real the city feels to you, the more real it will seem as your characters explore it. How planned is your city? Is it neatly designed with specific districts for specific needs, or is a sprawling city that was built up, renovated, and repopulated over time? How easy is it to travel from one location to the next? Are street names easily visible, is the city designed in a grid that anyone can understand, or is it full of sharp turns and hidden side streets and roads that frustratingly end in dead-ends? And what kind of traffic might your character expect? Congested streets thick with car fumes, sidewalks packed shoulder-to-shoulder, or sparse dirt lanes with only the occasional passing tractor? What kind of housing do people live in? Apartments? Cottages? Shacks? Do they live in grottos chiseled into the side of a mountain, or on boats docked along the riverbank? How far do they have to travel to get to work or school? Is there some centralized location, like a town square, a university, a mall, or a church? This goes into how planned your city was, and it’s worthwhile to consider, as this might involve useful landmarks your character might utilize as they travel. A city under the heel of an authoritarian government might be designed around the governor’s palace, while a city that’s bookish and intellectual might have a town square populated in libraries and bookshops. A religious city might have a religious statue or chapel in its beating heart, whereas a fishing village might built itself around a lake or riverbed. Where do they get food and other supplies? Consider where the farms and orchards might be located, or the mines, or the places to hunt for food. A city might have rooftop gardens for sustenance; or maybe as you travel further south, you arrive at the farmlands and fields. This one is fun. And vital for imagining your city as having a living, breathing economy. Consider what kind of shops your character might use or walk past. Diagon Alley feels real because we can envision Ollivander’s, with boxes upon boxes of wands for sale, and Flourish and Blotts with shelves upon shelves of magical books. Make a list of goods relevant or unique to your fantasy city–If they need potions, there could be apothecaries and cauldron shops and dried herb markets. If they wear robes, consider seamstresses, fabric shops buried in ribbons and lace; shops that tailor in bottomless pockets for all occasions. A city that uses gemstone magic might have stores of mining supplies, or stalls along the sidewalks of people hawking their stones. Where do your townsfolk buy their food? Farmer’s markets? Corner shops? Huge, baldly-lit grocery stores? What is sold in the average shop — farming supplies, traveling gear, swords, potions, makeup, pets, clothing, coffee? Populating your city with appropriate shopping and storefronts will make it even more tactile and easy to imagine being real. Consider what jobs and trades and other economic opportunities your city might have. Does your city have bankers? Shoe-shiners? Street peddlers? Theatres? Teachers? Real estate agents? Cobblers? Garbage men? Speaking of jobs and shopping, consider your fictional currency. Do your townsfolk trade goods, or do they have a type of coin or cash to exchange for services? For instance, in Diagon Alley we see Goblin bankers at Gringotts, Ministry of Magic employees passing through, seedy salesmen of suspicious things down Knockturn Alley, Madam Malkin the seamstress, Florean Fortescue, the owner of the ice cream parlor. Really dig deep and imagine what labor specific to your city you might populate your world with. You might not use all of these details in the actual story, but having a list of possible jobs and trades that might be going on in the background will come in handy eventually! And finally, we consider the little details. The splashes of color that make your city come to life. How do people dress in your city? Is their any slang particular to this area, or other customs or traditions? What sorts of problems does your fictional city have to deal with? What might people along the street be complaining about? Consider Harry walking through Diagon Alley for the first time and hearing a woman criticizing the prices outside of a shop. Does your city have a funky smell? A pushy police presence–or no police presence at all? Consider some of the pros and cons of your particular city in order to flesh it out more believably. And going off of that, consider some of the banter and dialogue your character might pass on their journey. People sweeping their front stoops, chasing raccoons out of the garbage, throwing slop to pigs, pinning laundry to clothes lines, bartering for purchases, picking pockets, gossiping, giving coins to vagrants, or else stepping over the homeless without acknowledgement. Think of little actions specific to your city your character might see or overhear. For instance, say you’ve got a city built along a beach. Your character might pass people untangling fishing line, polishing surfboards, selling oysters, complaining of sun burns. In a treetop city, you might have someone chasing squirrels out of their treehouse, or repairing a rope bridge, or hanging lanterns from the branches above their balcony. Details like this, significant to your fictional city, will make it more real and more easy to visualize for your readers. I think that about wraps it up for us today! I hope I’ve inspired you to think up something wonderful and imaginative for your fictional city! If you liked this post, share it on social media via the links below, and be sure to leave a comment — What are some unique facets of your fictional cities? How do you come up with names for your cities, or for the shops and business that populate them?